The Great Pie a Recipe fit for a Queen. 2) In a frying pan, brown the game. 3) Soften the onions and then add the garlic, mushrooms and bacon and fry for a few minutes. Add the stock and orange juice and zest. Raise it to a boil then simmer for an hour until the meat is tender. 4) Let the mixture cool and add it to your short crust pastry case. Add a pastry lid and press it onto the lip of the base then trim it. Cut a steam hole or two and brush with a beaten egg all over. 5) Put the pie in the oven and bake for one hour. Cool before serving. 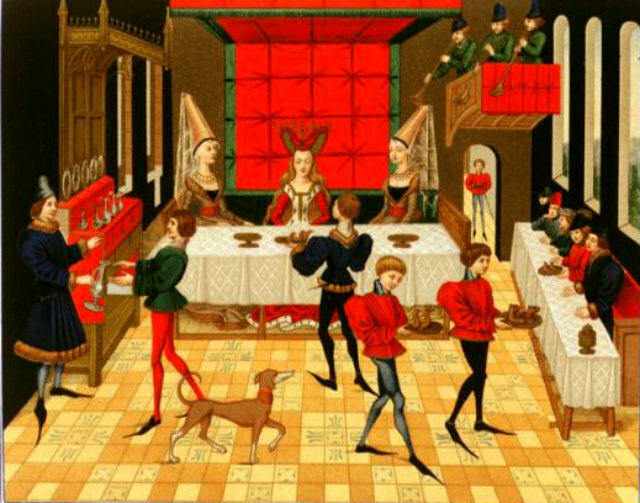 Read on via Fit for a queen: 3 medieval recipes enjoyed at English and Scottish royal courts | History Extra. This entry was posted in ART AND CULTURE and tagged ancient, food. Bookmark the permalink. ← Struggle of the Working Poor, China & India.